How Would You Describe the Sound of Eric Trump's Voice in This Clip? 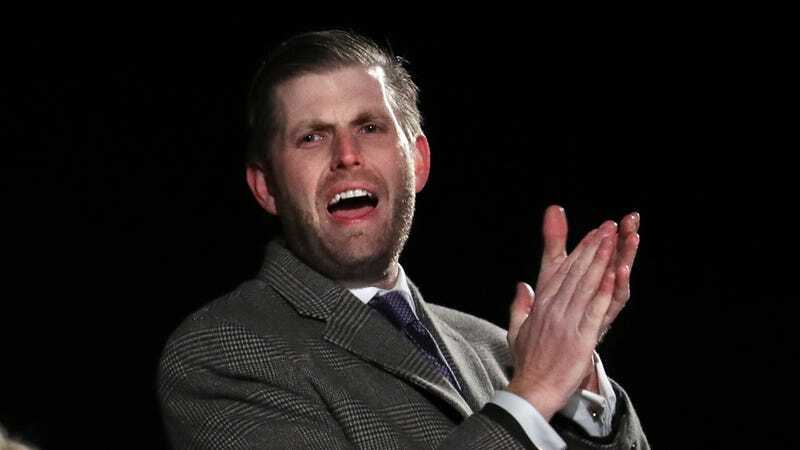 Eric Trump graced the set of Fox and Friends Tuesday morning with his trusty flesh beard and one goal in mind: defend his family using his characteristic anger man petulant cry screech. On the shriek docket: claims that Axios reporters couldn’t “keep up” with his father on the 2016 campaign trail (Axios was founded in 2017), that his father hasn’t left the White House in five weeks (he went golfing with Tiger Woods last weekend), and that his father has an amazing work ethic (despite having allotted 60 percent of his schedule to “executive time” since the 2018 midterms). Trump describes his sister as a “powerful woman who has done more for women than probably anybody in Washington, DC” He’s right, of course: Ivanka’s presence at vapid leadership conferences sponsored by Wall Street has improved my life in ways you couldn’t even begin to fathom!